Cranberries go hand in hand with turkey at Thanksgiving, but my children really seem to love cranberries and enjoy dried cranberries as a snack throughout the year. I created this recipe as a tribute to the American holiday and a quick way to make the seasonal meat-and-cranberries flavor last through the year, long after turkey time and berry season are over. ½ tsp salt. If the chicken is unflavored, use 1 teaspoon of salt instead. Mix the ingredients together along with seasonings. Store in the refrigerator for 30 minutes and serve. If you buy a whole roasted chicken from the grocery store, you can make the most of your purchase by using the leftover chicken from your meal to create this recipe. 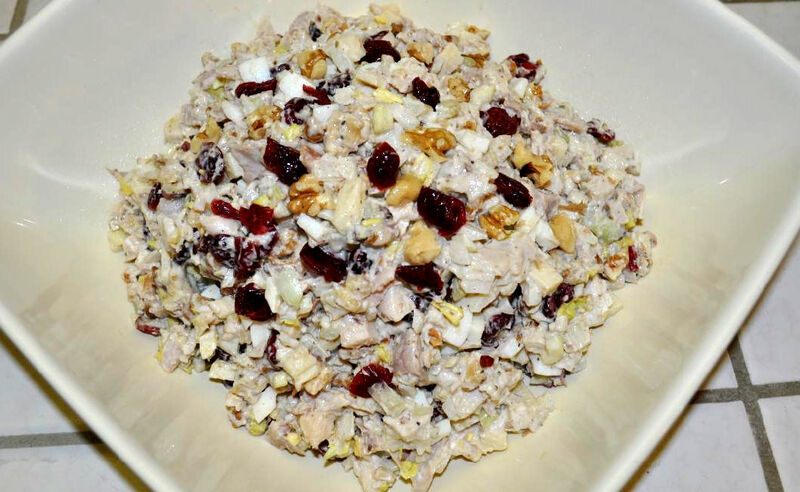 The chicken salad can be seasoned to taste and served as a side dish or used to make sandwiches.